What is also unbelievable is that people are choosing a lecture on intestinal cleansing by a retired basketball player over the sun and Caribbean Sea outside. And it is especially unbelievable that a solid third of the 3,000 people aboard the MSC Poesia cruise ship are here to pack their days with yoga, meditation, and lectures on emotional purpose and physiological prevention instead of the all-you-can-eat, drink, gamble, spend, and sunbathe pleasures the rest of the passengers are pursuing. Since Holistic Holiday at Sea launched in 2003 with 300 paying participants, its client list has nearly quadrupled with people drawn to the idea of taking a cruise steeped in gourmet vegan meals and the ideas and practices of some of the world’s leading specialists on the benefits of a holistic lifestyle. Like Salley, I can’t believe I’m here either. “Think of it as spending a week at a floating Kripalu,’’ my husband suggested to promote the trip. For the record, I’m an avid yoga practitioner. For physical, not ethical reasons, I’m a loose vegan. If you serve me fish or ice cream or scrambled eggs, I will eat them with naughty glee and the excuse that I am accepting your kind offer. As much as I am sure that herbs and shiatsu and meditation heal, I would rather spend my spare time and money learning another language or how to surf or ride a horse. As for cruise ships? Containment with organized port releases is not my idea of travel. So, how did I end up on the holistic cruise with daylong classes on “Easing Stress, Strain, and Fatigue with Flower Remedies’’ and “Feeling Great at Any Age with 5 Organ Qi Gong’’? The MSC Poesia, which launched in 2008, resembles a floating Las Vegas Bellagio. Fifteen floors below the bars and restaurants, balconied cabins, performance venues, and the deck’s spectacle of tile, wood, hot tubs, saltwater pools, spa and upscale gym, I am relieved I can still feel the titanic forces of nature. It’s not enough for the thousands of well-heeled sun and buffet worshipers to adopt a lurching gait, but just enough to remember that we are at sea. The weeklong voyage docks in the Florida Keys, Ocho Rios, Jamaica, Grand Cayman in the Cayman Islands, and the Mexican island Cozumel. It turned out the name was PETA (People for the Ethical Treatment of Animals). The turkey was tofu. What began as humiliation and uninterest became a life-changing epiphany. “Something like I’m seeing here on a level I never expected is new ways of dealing with bad energy, bad ailments, bad medicine,’’ Salley says. I did expect the sit-down dinners standard on cruise ships. What I didn’t expect were five-course vegan - or gluten-free, if preferred - meals on a level to rival gourmet cooking. Imagine exotic pates of nothing to do with animal guts, followed by dreamy, unusual cream soups such as squash salsa with what tasted like crabmeat; a radicchio, avocado, and coconut-sprinkled salad, followed by curried vegetable paella and delicious imitations of Key lime pie, raspberry mousse, and chocolate cake. Surprised by great food, good weather, and intriguing styles of exercise and thought, I became interested in the others with whom we shared our meals and classes. My stereotypical assumption was that they would be from the Northeast, California, Miami, and Manhattan, where vegan restaurants, acupuncturists, and yoga studios are common. I was wrong. The majority of the crowd was from places such as Michigan and Pennsylvania; Alabama mothers and daughters; entire families from Texas and Georgia; and couples from Vancouver, British Columbia. “This lecture is being run by Yogi Desai?’’ he responds. As he passes by us heading to his center seat, Yogi Desai leans in, “You know what this stuff is?’’ he asks me directly, knowing from some yogi-powered radar that I am one of the more active cynics in the crowd. “What?’’ I whimper. Many people seem to be on board because they have already made the shift to a clean diet lifestyle and are drawn by the idea of a week being edified by holistic celebrities such as Joan Borysenko, the Harvard-trained medical scientist who has a lot to say about the evidence-based success of a clean body-mind lifestyle, and T. Colin Campbell and Tom Campbell, the father and son who authored, “The China Study,’’ about the effect nutrition has on long-term health. The central event is called the “Recovery Panel’’ and is made up of people who have studied and/or experienced food as medicine. They are all concepts practiced by my husband, who beat cancer eight years ago. Supportive, yet bored by the hyper-pure, I trot openly each day pre-yoga and meditation to the morning buffet for the drug I’m not dropping: caffeine. Pippin Ross can be reached at pippinross@yahoo.com. 434 Aragon Ave., Coral Gables, Fla. 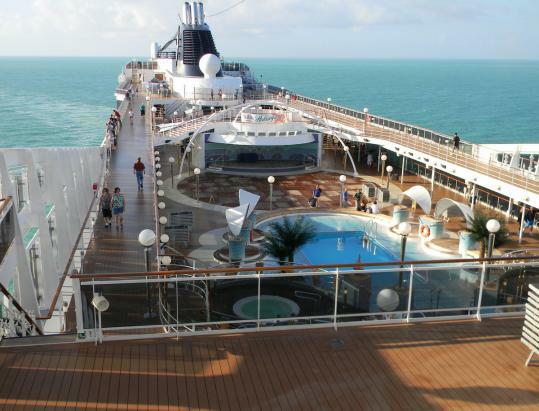 The next Holistic Holiday at Sea cruise is March 3-10. MSC Poesia will depart from Fort Lauderdale, Fla., with stops in St. Thomas, US Virgin Islands, San Juan, and Nassau, Bahamas. There are 35 presenters and 130 classes to choose from, day trips, parties, and regular events such as the “Recovery Panel’’ in which people detail overcoming dire ailments by using food as medicine. All meals are vegan and/or gluten-free. The all-food, all-the-time buffets, discos, and slot machines used by cruisers who are not part of the holistic program are open and accessible. From $1,299.